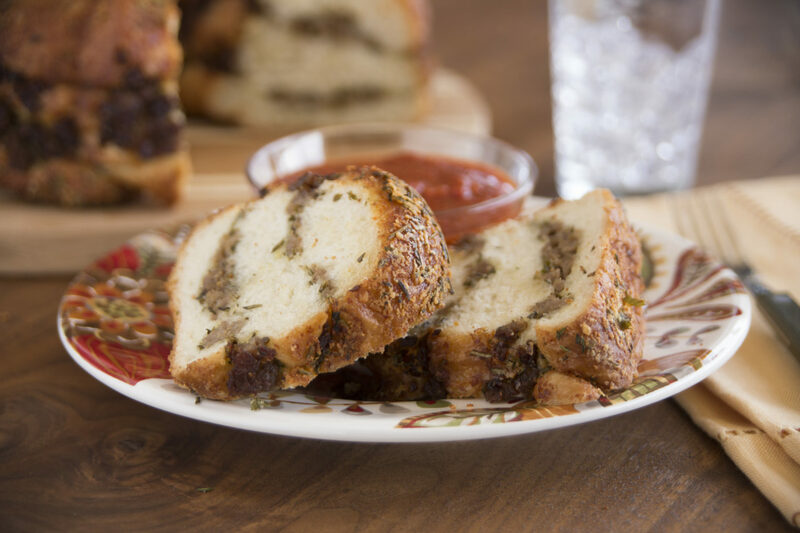 Bake bread, sausage and cheese in a beautiful bundt and get ready to receive rave reviews. Flatten each roll into a 4-inch circle. Place butter in a shallow bowl. Combine herbs and cheese and place in another shallow bowl. Coat both sides of each dough circle with butter and then with cheese mixture. Arrange 6 dough circles evenly in a large sprayed bundt pan, to cover the bottom. Circles will overlap. Sprinkle half the cooked sausage over dough. Repeat with 6 more dough circles and the remaining sausage. Add last 6 dough circles to the top to cover sausage. Cover with plastic wrap and let rise until almost double. Remove wrap and bake at 350°F for 35-40 minutes. Cover with foil last 10 minutes of baking. Serve warm with marinara sauce. Remove from oven and invert onto serving platter.